There is nothing quite like homemade jam. When you make it yourself, it tastes so much more like the fruit it came from rather than the overly sweet confectures you find at the grocery store. If you've always wanted to make your own jams or preserves but were daunted by the process, there are two easy methods you can try: boiling without a thickener or boiling with a gelatin thickener. 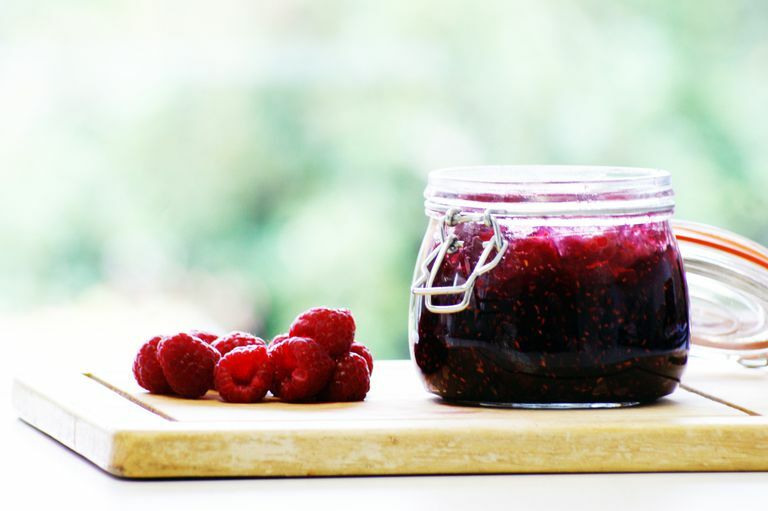 Jams and preserves can be a perfect part of a low-carb diet if they are sugar-free. However, making them without sugar can be a bit tricky since it not only acts as a preservative but provides the finished product with its characteristic "jammy" mouthfeel. But, trust us when we say that, with a little practice and the right choice of fruit, making a sugar-free jam is not only easy, it may become part of a new family tradition. Of all of the fruits you can use, berries are probably the best for a low-carb jam. They are naturally low in carbohydrates and sugar and usually contain pectin, the substance that gives jam its gelatinous body. Strawberries and blackberries have among the lowest carbohydrates overall with only six grams of net carb and 7.5 grams of fiber. Raspberries are also an excellent choice with seven grams of net carb per cup. The simplest method of jam-making is boiling. This works best with blackberries or raspberries since they are a higher percentage of pectin. The boiling help release the pectin and evaporate some of the excess water to give the jam a more spoonable texture. Place two cups of berries in a non-reactive, non-aluminum pan and crush them lightly. Add a cup and a half of water and two tablespoons of lemon juice. Add an artificial sweetener like liquid Splenda which doesn't have the aftertaste or extra carbs of the powdered form. Two tablespoons should be more than enough. Bring to a boil and cook on a high heat for five minutes, stirring as necessary. Lower the heat to medium and continue cooking for another 10 to 15 minutes. Skim off any foam as it cooks. The jam will ready when the bubbles get bigger and the liquid has the consistency of cream of wheat. Two cups of berries will yield roughly a half cup of jam. If you want to make larger quantities, simply multiply the recipe and increase the cooking times by 25 percent for every two additional cups of fruit you use. By using the boiling method, the jam will not be as "jammy" as your typical preserve but will hold together nicely when chilled. This is the best method for making strawberry jam since strawberries are full of water and have little pectin. You can choose to either use unflavored powdered gelatin, which is simple to use but has a slight aftertaste, or leaf gelatin, which is flavorless but bit more costly. For this recipe, you would use either a 0.25-gram packet of gelatin (two tablespoons) or three gelatin leaves. Packet gelatins need to be bloomed. Blooming involves sprinkling the gelatin powder over water and allowing it set into a solid mass before cooking. Leaf gelatin needs to be soaked. Soaking softens the leaves and makes them easier to dissolve when cooking. Both methods prevent gelatinous lumps from forming, which are not unpleasant to taste but may result in a runnier jam. Add two cups of water to a non-reactive, non-aluminum pan. If you are using powdered gelatin, sprinkled the gelatin over the water and allow to sit for five minutes until solid. If you are using leaf gelatin, add to a separate bowl of warm water and allow to sit for 10 minutes, completely submerged. Heat the pan over a medium heat until the liquid comes to at a slight simmer. If you're using leaf gelatin, remove it from the water, give it a little squeeze, and add to the simmering liquid. Add two cups of coarsely chopped strawberries, two tablespoons of liquid Splenda, and a teaspoon of lemon juice. Increase the heat to high and boil for three minutes. Reduce the heat to medium and lightly boil for another five to 10 minutes. Skim off any foam as it cooks. The jam is done when the bubbles are thick and the jam is consolidated and smooth. Two cups of strawberries cooked in this way will yield around a cup of jam. You can double or triple the recipe to make a larger batch, increasing the cooking time by 25 percent for every two additional cups of fruit you use. Most home jam-makers will use a commercial pectin to give their preserves a more spoonable, gelatinous texture. However, if you're going low-carb, may want to avoid these as most contain added sugar. There are some sugar-free pectins you can buy, like Sure-Jell, that can give your jams and preserves more body. These may be especially useful when making strawberry jam since strawberries have relatively little pectin. As you get used to making jams at home, you can experiment with pectin and see how it affects the finished product. Since you won't have any sugar in your jam to act as a preservative, you will want to freeze whatever you have leftover if you don't plan to eat it within a couple of weeks. Unlike sugar-free jams you find in stores, yours won't have any chemical preservatives to extend its shelf life.